CARACAS, Venezuela–After announcing this week the devaluation of its currency (the Bolivar), the Bolivarian Republic of Venezuela is practically isolated. 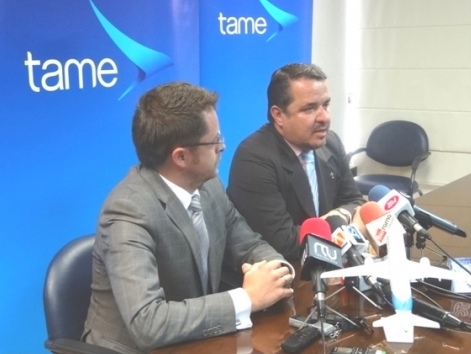 The Venezuelan travel agencies have stopped selling airline tickets after some international carriers like Air Europa, Iberia, Air France, Lufthansa, TAP-Portugal, TAME, COPA, United and American Airlines also decided to suspend ticket sales. The Venezuelan Government has a debt of up to 2800 million Euros with all the international airlines operating to the socialist country. This week governement officials met with Air Europa executives, hoping to find a solution in order to pay the debt with the airline, up to 130 million Euros, but it seems both parts couldn’t reach an agreement. The economist Francisco Faraco has defined the situation as “The Bankruptcy of the Venezuelan State”. 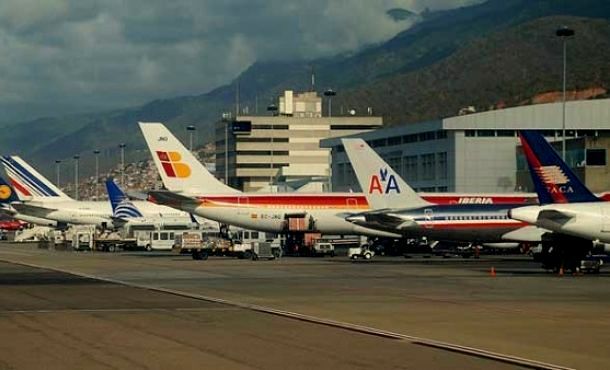 Its believed that more airlines will suspend sales and most probably operations to Venezuelan airports in the near future. Airlines are suspending ticket sales in Venezuela. Some are even considering suspending flights to Venezuelan airports. This entry was posted in Airline Alliances, Caracas, Venezuela and tagged Air Europa, Air France, American Airlines, CADIVI, Caracas, COPA Airlines, Iberia, Lufthansa, TAP Portugal, United Airlines. SAN JOSE, Costa Rica–Johnny Araya Monge, the presidential candidate of the National Liberation Party (PLN) promised if he wins the elections in Costa Rica next February 2nd, to construct a new airport for the caribbean port city of Limon. In 1974 the Costa Rican Government opened the Limon Airport close to the Caribbean Sea. 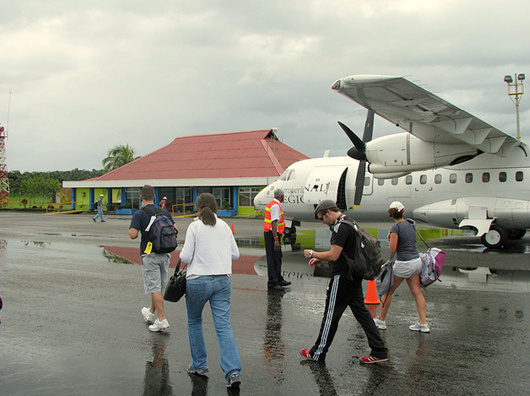 Domestic airlines in Costa Rica (LACSA, Aerovias Cariari, AVE, SANSA and later Nature Air) operated flights from San Jose to Limon, but no international flights have ever used the terminal that uses the IATA code LIO. The other provincial airport in Guanacaste (Liberia International Airport) which was also opened in 1974 became an international airport in 2001 when Delta Airlines started its non-stop Atlanta-Liberia non-stop run. The Daniel Oduber Quiros International Airport in Liberia has helped the development of tourism in the region and it is exactly what the politicians and the tourism industry requires for the Limon Province, the poorest of Costa Rica but one with rich Afro-Caribbean culture and folklore, white sandy beaches and the beginning of a coral reef that goes all the way north to the Yucatan Peninsula. A new international airport for Limon is the newest political promise, but one that is a real need for the province. Limon International Airport has no scheduled domestic or international services. This entry was posted in Airlines, Central American Airports, Central American Domestic Airlines, Costa Rica, LACSA, SANSA and tagged Aerovias Cariari, AVE, Costa Rica, LACSA, Limon, Limon International Airport, Nature Air, SANSA. SAN JOSE,Costa Rica–By 2025 Costa Rica should have it’s new airport to service San Jose and the Central Valley. This would be the third airport (La Sabana Airport inside the city served until the 1950s when the El Coco Airport, today Juan Santamaria International Airport took over). The new mega airport will be constructed in the region of Orotina, on the Pacific Coast of the country. The project is to construct a Central American Mega-Worldport that could connect the “heart” of Central America with the U.S., Canada, Europe and Asia. Juan Santamaria International Airport (MROC) is today the second busiest airport in Central America after Panama’s Tocumen International Airport, but still Costa Rica is the power house of tourism in the region. The new Orotina International Airport will compete with Tocumen (that has had several terminal expansion) and El Salvador’s Comalapa International Airport (Avianca’s Central American hub) that should be upgraded in starting this year. The Orotina International Airport will double in size in comparison to Juan Santamaria, will have two runways and a super terminal that could accomodate several airliners including the Airbus A-380s, A-350s and Boeing’s 747-800s, 777s and the 787s Dreamliners. Juan Santamaria International Airport would be used as a regional airport for Central American flights, charters and executive airplanes. AERIS is the private company that manages the Juan Santamaria International Airport unil 2021. Its expected that the construction and management of the new Orotina International Airport will be handled by a private company. 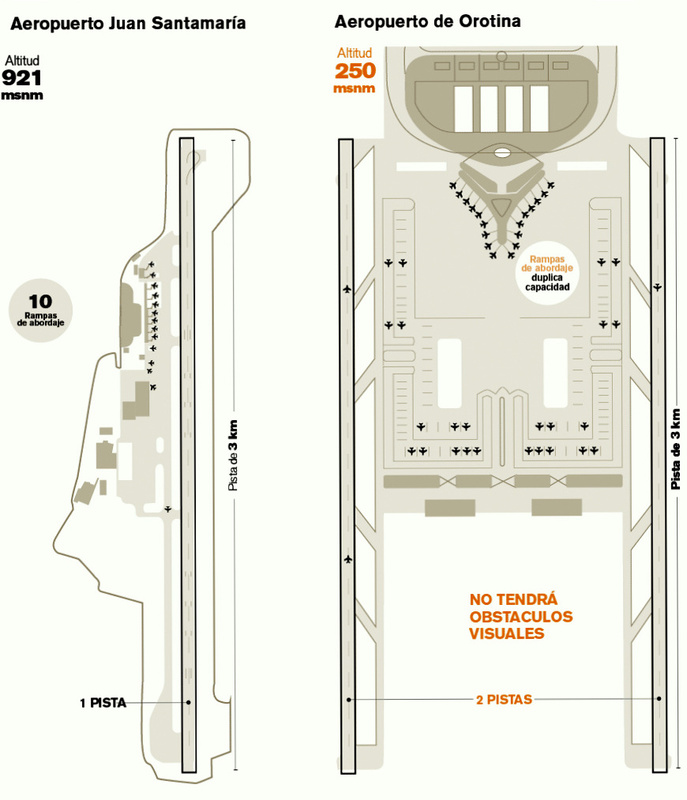 The new Orotina International Airport will have two extended runways at sea level. This entry was posted in Airlines, Central American Airports, Central American Domestic Airlines, Costa Rica, Juan Santamaria International Airport, LACSA, Latin American Airlines, Latin American Flag Carriers, Latin American Low Cost Carriers, Orotina International Airport, TACA and tagged 2025, Alajuela, Comalapa International Airport, Costa Rica, Juan Santamaria International Airport, Orotina International Airport, San Jose, Tocumen International Airport. 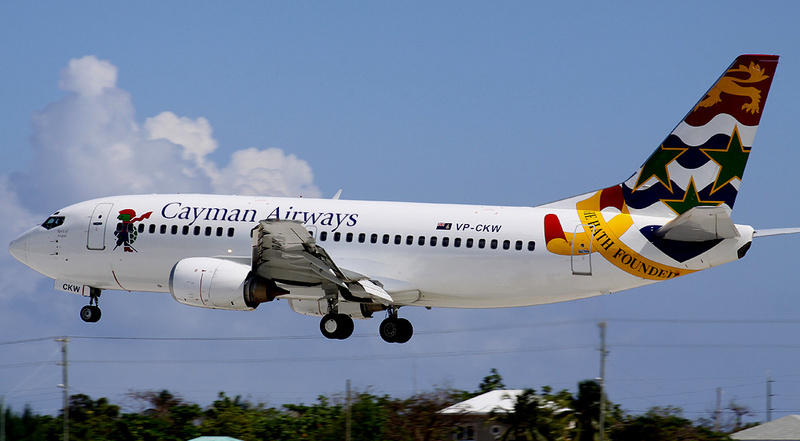 GEORGE TOWN, Grand Cayman–National flag carrier Cayman Airways Ltd. could enter a new phase of expansion during 2014 that could include new routes to Costa Rica, Panama and Colombia. 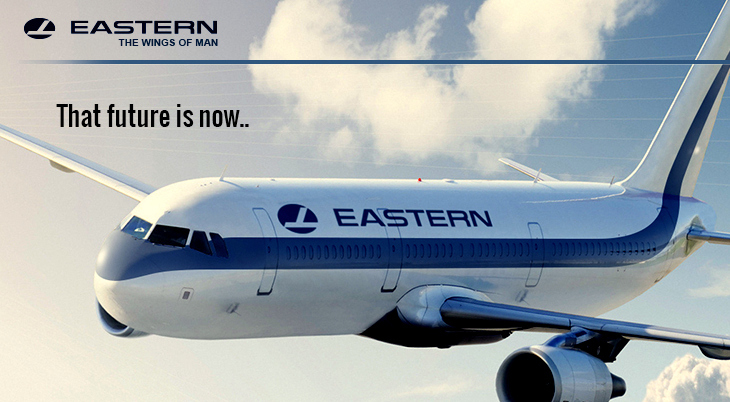 The airline was established and started operations on August 7th, 1968. It was formed following the Cayman Government’s purchase of 51% of Cayman Brac Airways from LACSA (the now defunct Costa Rican flag carrier) and became wholly government owned in December 1977. A few months after it was formed, Cayman Airways flew its first international route to Kingston, Jamaica leasing a LACSA BAC-111-500. The airline acquired its first jet aircraft in 1978 and began services to Houston. In 1982 the airline acquired a Boeing 727-200 aircraft to strengthen the airline’s regional and international capability, also allowing for the introduction of first class service. These jets were eventually replaced with Boeing 737-300 series, and during the 1980s Cayman Airways offered scheduled or charter service to Atlanta, Baltimore, Boston, Chicago, Detroit, Minneapolis, Newark, New York, Philadelphia, & St. Louis. As the national flag carrier for the Cayman Islands, Cayman Airways now operates non-stop Boeing 737 jet service between Grand Cayman and the following major US cities: Miami and Tampa, Florida; Washington DC; New York, New York; and Chicago, Illinois. Nonstop jet service is also provided between Grand Cayman and regional destinations, including: Kingston and Montego Bay, Jamaica; Havana, Cuba; and La Ceiba, Honduras.The airline’s Cayman Airways Express service also operates Twin Otter aircrafts between Grand Cayman and the Sister Islands of Little Cayman and Cayman Brac. Cayman Airways is expected to open new routes in 2014 to Central America and Colombia. This entry was posted in Airlines, Caribbean Airlines, Cayman Airways, Central American Airports, Colombia, Costa Rica, Grand Cayman, LACSA and tagged Cayman Airways, Cayman Islands, Colombia, Costa Rica, Grand Cayman, LACSA, Panama.